R.E. Josey, three-time AQHA World Champion Calf Roper, left his mark on the world by winning the prestigious titles on three different horses, Major Chalfant in 1970, a sorrel stallion named Toebars in 1972 and Silver Creek Jak in 1974. Toebars was ridden in 40 AQHA calf-roping competitions and won 35. R.E.’s unique skill of selecting and training winners, combined with his expertise of working with both horse and rider, making them a winning team, has been sought after by top ropers and speed-event riders alike. Inducted into the Texas Cowboy Hall of Fame in 1998, R.E. continues to compete in Team Roping competitions on his newest champion, Phylis Can Phly. Together with top instructor, Jeb Barney, R.E. recently produced a series of videotapes designed to take calf ropers “back to the basics” by teaching the foundation necessary for beginners and essential for serious competitors going for that all important win. WPRA, AQHA and NBHA World Champion, Martha Josey, has continued her legendary career on many horses, reflecting her keen training and horsemanship ability. Beginning in 1964 on her great gelding, Cebe Reed, this explosive pair won 7 horse trailers and 52 barrel races in a row. Cebe qualified Martha for her first NFR in l968 and again in l969. Martha later teamed up with her immortal gelding, Sonny Bit O’Both, and this powerful combination went to the NFR 4 years in a row, from 1978 to 1981. In 1980, Sonny set an all time record of being the only horse in history to win the AQHA and WPRA World Championships in the same year. Inducted into the Cowgirl Hall of Fame in 1985, Martha continued competing and winning on the Pro Tour Circuit, aboard a new partner, Jetonfer Pay, and took him to the NFR in 1985. Swen Sir Bug, “J.C.,” qualified Martha for the NFR in 1987 and was the champion she chose to ride representing the United States in the 1988 Winter Olympics in Calgary, Canada. History was made once again as Martha Josey received a medal in front of 100,000 people, returning home an Olympic medalist. Mr. Revolution Bars took Martha to the NFR in 1989 and again in 1990 helping her go to the NFR in four consecutive decades. “Rev” won the 1990 All American Quarter Horse Congress and was the two-time Wrangler Showdown Champion. In 1997, Martha rode a stunning 16.2 sorrel gelding named Orange Smash and won the NBHA Senior World Championship and Reserve Open 1-D Championship in Augusta, Georgia. 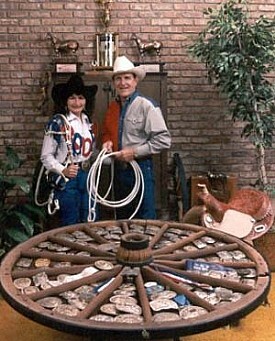 This dynamic duo has continued to win big, qualifying for the NFR in 1998, and received the Gold Go-Round Winner Buckle. In 1999, Martha was chosen as the Women’s Sports Foundation, AQHA National Female Equestrian of the Year and was also presented the Dennis D. High Award in Denver, Colorado, as a distinguished Lifestyle Leader for the Western/English Sales Association. Orange Smash received top honors as well, by receiving the 1999 AQHA “Best of America’s Horse Award” and having his spectacular image captured by Peter Stone, on a collectable statue. In 2000, Martha teamed up with another champion, Joe B Jammin and ran the fastest time at the Lone Star Finals. They went on to be the Go Round Winner at the 2001 Copenhagen Cup Finale in Dallas, Texas. In 2002, Martha took top honors at the NBHA Holiday Classic in Jackson, Mississippi winning the Senior 1-D Championship on Joe B Jammin and the Senior Reserve 1-D Championship on her mare, Sweet Sailin’ Six. In 2003, Martha and Joe B Jammin were the 2003 Equus America, Equus Extreme Champions, in Houston, Texas and the 2003 AQHA Reserve World Champions in Oklahoma City, Oklahoma. Combining their tremendous love of rodeo with an extensive training and teaching program, R.E. and Martha Josey, along with Team Josey, host clinics and schools specializing in World Champion Barrel Racing, Horsemanship and Calf Roping at their equally famous Josey Ranch in Marshall, Texas and across the nation. The Josey’s also train and market the very best in barrel and rope horses at the Josey Ranch and offer a selection for every level of competition. Many winning competitors have purchased their horses and equipment from the Josey Ranch. R.E. and Martha host several nationally acclaimed competitions at the Josey Ranch, including the Josey Jr. World Championship Barrel Race, the most prestigious barrel race for youth, age 20 and under, in the world, and the Josey Reunion Round-Up. This unique barrel racing and calf roping competition is open to all Josey students, over 50,000 of them! Their Josey Western Store is open year-round, offering Ranch visitors and mail-order customers around the world, a complete line of quality equipment, including their Josey Circle Y saddles, and the very best in supplies and horse health products. Quality being synonymous with the Josey name, R.E. and Martha are spokespersons for a number of national companies such as Circle Y Saddles, Big Tex/Cimarron Trailers, Eagle Valley ABM, East Texas Ford, EZ-All, Josey Pro*Kold, Oster, Priefert, Purina Mills, LLC., Rambo, Roper, Thorobred-Hawthorne, Troxel and United Vet..